Publication of monthly balance of goods and services started in 2018. 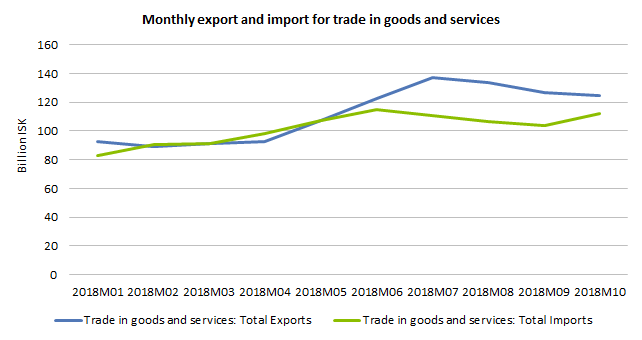 Data for trade in goods in BOP* and trade in services is now available for the first ten months of 2018. Total export of trade in goods and services is therefore estimated 124,400 million ISK in October and total import of trade in goods and services is estimated 112,000 million ISK. The surplus of balance of trade in goods and services is estimated 12,400 million ISK. *According to BOP and NA standards.